My first trip to Verde Island was so simply incredible that it had me altering our dive schedule to include several more returns during that visit. We were staying in Puerto Galera – the jumping off point for Verde Island. Puerto Galera has a thriving nightlife with restaurants, dancing, floating bars and live bands all set on a crescent shaped beach lined with resorts and palm trees. The village backs onto picturesque and lush tropical jungle and clear tropical waters lap the shoreline from the front. 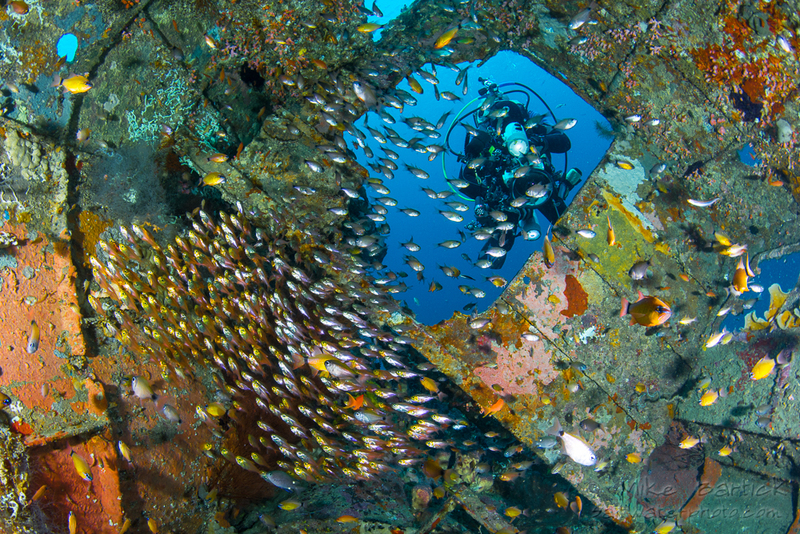 The dive sites are just minutes from the launch and can vary from drifting over lush coral-scapes and wrecks to some very interesting critter dives. After a 30-minute speedboat ride from Puerto Galera/Sabang we arrived at Verde Island’s eastern-most tip where the only thing visible from the surface was a small spine of rocks and a mooring line. So far, from the surface, the area looked like any other but all of that quickly changed as we casually descended to the pinnacles below us. The pull of the current was almost immediate and comfortably pushed us along allowing us to get our first glimpse of the reef. Changing directions we finned over to the pinnacle where “The Washing Machine” was and peeked our heads over the top of the saddle hoping to see the schools of pelagic fish on the other side. As I peered over the ledge the onrush of the mighty current was felt at once, making my mask vibrate and shooting our bubbles straight back. Ducking under the current again, everything was calm. I took a few deep breaths and powerkicked myself over the top and again experienced the calm eddy below the ridge. Looking back towards the pinnacles I was amazed at the colours and growth of sponges, tunicates, and corals all packed in layers on top of each other with hardly any exposed or lifeless rock. Bright orange and yellow Tubastraea cup corals and giant sea fans decorated the walls and pinnacles while an eye-popping variety of colourful reef fish buzzed with energy and movement. Schooling pelagic fish can also be seen in the blue and it is not uncommon, as I learned, to see bumphead parrotfish, rare red-tailed wrasse, sea turtles, sea snakes, tunas, jacks, giant trevallies, sweetlips, snappers, and barracudas. More than just Verde Island awaits in this lesser known area, with some of the best macro and wreck dives in Sabang bay. Be sure to book early and ask for packaged rates to get the best value on your next trip. You can even experience the best of both worlds on a 10-day trip split between Puerto Galera and Anilao and maximise your time in one of the world’s richest dive destinations!